Because the product contains cranberry fruit extract, it helps remove pathogenic bacteria from the urinary tract, especially the E. coli type. 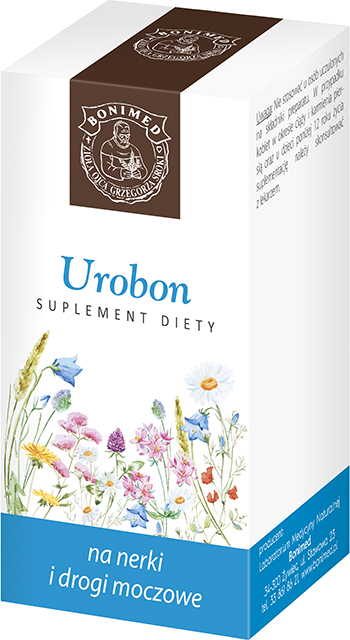 Because the product contains nettle and horsetail herbs extracts, Urobon stimulates the excretory and detoxifying functions of the kidneys, which also helps maintain a normal function of the urinary tract. Ingredients: Cranberry fruit extract, gelatin, horsetail herb extract, nettle herb extract, bulking agent (maltodextrin), anti-caking agent (magnesium stearate, silicon dioxide). Recommended daily intake of the product (6 capsules) contains: Cranberry fruit extract 1.8 g, nettle herb extract 300 mg, horsetail herb extract 300 mg. Recommended intake: Take 2 capsules 1–3 times per day. Dietary supplements should not be treated as a substitute (replacement) of a varied diet. Do not exceed recommended daily intake during the day. Caution: Don’t use it if you are allergic to the product ingredients. If you are pregnant or breastfeeding, talk to your doctor first.